Three years of planning, endless days of form filling and hours of spreadsheet preparation finally paid off this morning in the soft dawn light at the Mae Sot border crossing. 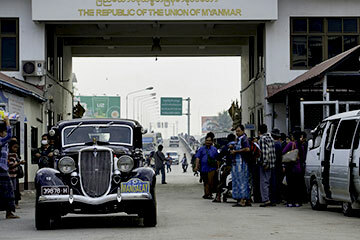 More than 60 rally cars from around the world along with the organisation vehicles lined up for the immigration and customs formalities of Thailand Out / Burma In. The Rockne 75 of Swiss crew Manuel and Irene Dubs was first through the barrier and was soon followed by an exotic mix of Bentleys, a Lagonda, a Rolls Royce and the Itala. The locals had never seen anything like this before and for a few minutes even the monks stopped their age old morning ritual of alms collection to watch the Rally arrive. It couldn't have gone more impressively either. 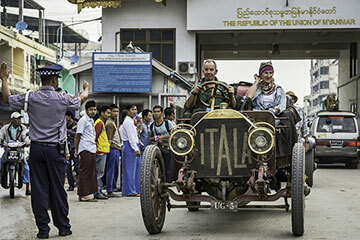 Jack Amies, the co driver of Martin Egli's well travelled Lagonda was impressed, "the AK47 wielding guards smiled and waved us through with barely a hitch". More good news was to follow in the shape of the not yet finished "new" road from the border. We were granted permission to be the first foreigners to use this newly laid, billiard table smooth 15km shortcut which also gave a much easier ride than the old precipitous mountain route would have done. Barriers were slid aside, rifle wielding guards snapped to attention and our cavalcade advanced. We had the road to ourselves, Len Treeter in the Cowboy Cadillac fairly glided from crest to apex past crowds of curious but welcoming road workers. This Tarmac heaven didn't last long though and after a while we crunched and bumped our way onto a strip of beautiful ochre red dirt which took us through rice fields and small villages. It was then on to the narrow and very bumpy tarmac main road north. Being so close to Chinese New Year meant that the street parties continued as we passed by and crews were serenaded by traditional bands, dancing dragons and wildly cheering children. There have been a few problems today though, David and Jo Roberts suffered minor mechanical problems at the border in their Sunbeam Alpine and Hans Middelberg / Jurgen Grolman were forced to call a truck after suffering a broken halfshaft. Tonight we are in Mawlamyine on the banks of the Salween river, this is the fourth largest city in Burma and was the first capital of British Burma in the 19th Century. Most notably though the town features in the opening line of Kipling’s Road to Mandalay… "By the old Moulmein Pagoda ...... "